When a patient arrives in the department with a painful condition Think analgesia, sling, local anaesthesia, narcotics. Do not send any patient away without some pain relief. You may only have to suggest they use the simple analgesics they have at home or can buy at a chemist. The safest and most effective way of providing adequate analgesia is to administer small quantities of diluted morphine intravenously. Most patients with acute myocardial infarction require about 5mg of morphine IV given with either 12.5 mg of Prochlorperazine or 10 mg of metoclopramide. The morphine can be diluted with equal amounts of water for injection. It is also important to appreciate that those patients with severe abdominal pain caused by peritonitis cannot wait indefinitely before they are assessed by on-call surgeons. Such patients would benefit greatly by titration of small amounts of intravenous opiates given at frequent intervals. For paediatric patients and information on intranasal diamorphine (unfortunately not available in Eire) please refer to our paediatric analgesia section. The dose in a child is 1 ml of 1% plain Lignocaine for each year of the child's age. Methods of infiltration for local anaesthetics. Use as small a needle as possible. Repeat process distal to the wound. Sudden loss of consciousness, with or without tonic-clonic convulsions. Cardiovascular collapse: bradycardia, conduction blocks, asystole and VT.
Stop injecting the LA, Call for help. Maintain the airway, 100% oxygen and ensure adequate lung ventilation. Confirm or establish intravenous access. Start cardiopulmonary resuscitation (CPR) using standard protocols. Manage arrhythmias using the same protocols. Prolonged resuscitation may be necessary. Give an intravenous bolus injection of Intralipid® 20% 1.5 ml.kg-1 over 1 min (100 ml). Start an intravenous infusion of Intralipid® 20% at 0.25 ml.kg-1.min-1(400 ml over 20 min). The Association of Anaesthetists of Great Britain & Ireland 2007 guidelines. 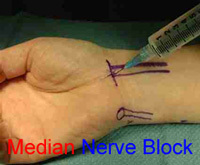 This is an extremely effective method of providing analgesia, especially in the upper limb. In general you must wait longer than direct infiltration for the block to work as the anaesthetic must diffuse into larger nerves. If the patient experiences pain in the nerve distribution then stop injecting immediately, withdraw slightly and try injecting again. Avoid use Adrenaline around end arteries e.g. digital, nose, ear or penile blocks. A further 1 to 2 mls over subcutaneous tissues may be needed. For the sole of the foot. Use 10 ml of 1% lignocaine ± Adrenaline. Do not use Adrenaline in patients with peripheral vascular disease. 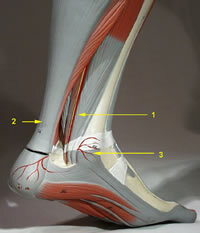 Aim medial to the tendo Achilles behind the posterior tibia artery, between the tendons of flexor digitorum longus and flexor hallux longus. Is used for forehead and scalp anaesthesia. The supra orbital nerve leaves the orbit through the supra orbital notch. This notch lies medially in the supra orbital rim, on a vertical line through the medial aspect of the cornea. The supra-trochlear nerve exits the orbit at the junction of the superior orbital rim and the medial wall of the orbit. The two nerves have a sensory distribution from forehead to coronal suture from mid-line to temporal region. Infiltrate subcutaneously completely parallel to the supra-orbital rim above the eyebrow 5 ml of 2% lignocaine with Adrenaline. Do not infiltrate directly around the nerve or its foramen. Content by Dr Íomhar O' Sullivan 11/12/2003. Reviewed by Dr ÍOS 08/07/2004, 25/05/2006, 27/02/2007, 18/02/2008. Additional background information on the management of LA Toxicity kindly provided by Dr Brian O' Donnell. Last review Dr ÍOS 28/12/18.